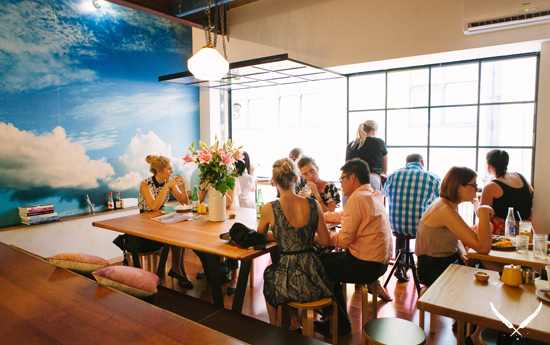 The gods of good coffee have been smiling on Brisbane's CBD in recent months. First they rewarded us with hole-in-the-wall coffee joint, Kitchen Door, then it was John Mills Himself and his (or at least the baristas' who now occupy his erstwhile print building) Filter Shot. 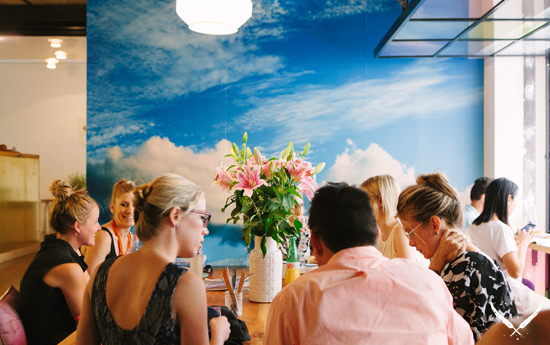 Our latest heaven sent caffeine fix comes courtesy of Felix Espresso and Winebar, a coffee shop with a liquor license in the pipeline that specialises in organic coffee and wholesome breakfast and lunch fair. Occupying a former storage unit on Burnett Lane, Felix's location sounds decidedly earthly but the combined know-how of husband and wife team Peter Kuhnell (an architect) and Gretta Bottomley (a jeweller) has transformed the unlikely building into a unique new dining space. The coloured glass of the shop front windows provides a dappled light by which to peruse your menu (fixed to a mini clipboard and changing daily, of course) and a mural of a cloudy blue sky sprawls out over the far wall. With its faded wooden furniture and inviting pink cushions, Felix's sunken dining area is the kind of place in which you could easy slip into coffee-fuelled reverie without so much as a second thought for the bustling city outside. 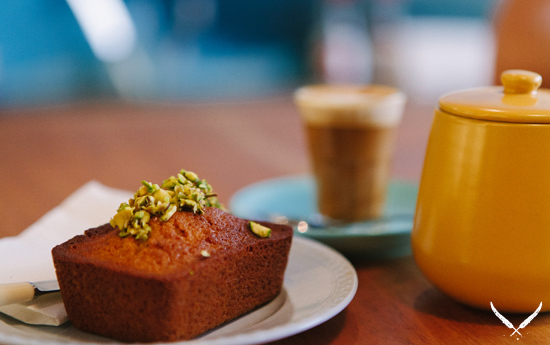 The coffee itself is locally sourced (expect flat whites courtesy of Cup Coffee and Woolloongabba's Cup Roastery) or selected from the best roasters around the country. Felix also offers tea (chai, Zest Blend, peppermint, chamomile), green smoothies, and the odd mango lassi or organic soda pop. And the food? Yup, you guessed it: organic, locally sourced, and delicious. Breakfast options span chia cups with cashew cream, jars of apple and blueberry-packed Bircher muesli and old favourites like jam and toast while lunch is all about overflowing baguettes and homemade pies from Mick Hobson, aka the Goat Pie Guy. For that space between breakfast and lunch where only sugar and carbs will do, Felix also do an impressive line of baked treats. Mini lemon yoghurt loaves, pistachio friands and even vegan cupcakes with mango icing have all been known to grace the cake stand. As Brisbane's CBD begins to hold its own in the coffee stakes, we'll be hoping and praying to be blessed with more places like Felix Espresso and Winebar.